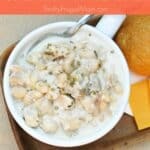 This easy Creamy White Chicken Chili is one of our favorite soups! Made with simple ingredients, it’s the perfect recipe to cozy up with in cooler weather. I love soups. In fact, I love them so much that I could eat them every day, at least during the winter months! And honestly, some weeks that almost happens at our house. Thankfully my family enjoys soup almost as much as I do, otherwise I’d be in trouble! This Creamy White Chicken Chili is one of my go-to soup recipes. It’s super fast to throw together (especially if you use leftover chicken), is full of flavor and filling too! Serve it with crusty bread and a salad and you’ll have a meal that is sure to satisfy! If you’re not a fan of food with a tiny bit of a kick, I’d recommend cutting back the cumin to ½ tsp. and the black pepper to ¼ tsp. I personally don’t think it is super spicy but my family prefers when I make the adjustments to tone it down a little. So play around with it and make it to suit your taste. To me, that’s half the fun of cooking anyway! 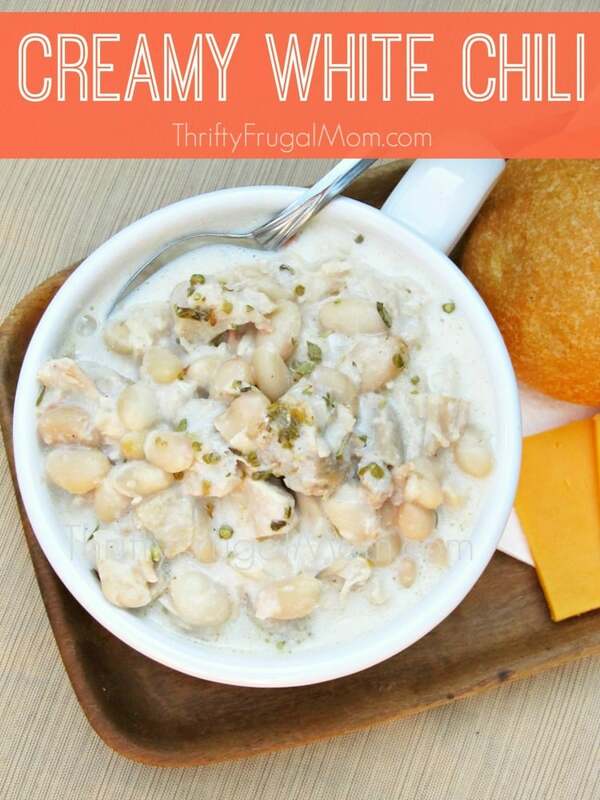 This easy Creamy White Chicken Chili is one of our favorite soups! Made with simple ingredients, it's the perfect recipe to cozy up with in cooler weather. In a large saucepan over medium heat, saute chicken and onion in oil until chicken is no longer pink. Add beans, broth and seasonings. Bring to a boil. Remove from heat; stir in sour cream and milk. Serve immediately. * Or simply use 2 to 3 cups cooked, chopped chicken and add along with the beans, broth and seasonings. Yum!! I love any kind of chili! With cornbread of course! I'll be trying this one for sure. I like chili too, but have found that white chili is by far my favorite! Hope you enjoy it! How would you make this in a slow cooker? Combine everything except milk and sour cream? Cook and add milk and sour cream at the end? I'm not an expert at converting regular recipes into slow cooker recipes, but I would think that would work. If you try it, let me know how it turned out! Will do! It is simmering in my slow cooker as I write. I will add the milk and sour cream at the very end and let them heat up a bit. Stay tuned!